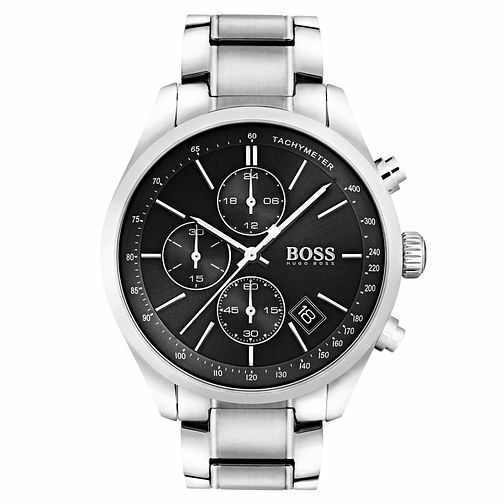 From the Hugo Boss timepiece collection, this robust watch for him is a stylish blend of vintage and contemporary. Features stainless steel case and bracelet minimalistic indices, chronograph function and classic logo branding. Hugo Boss Men's Stainless Steel Bracelet Watch is rated 4.5 out of 5 by 2. Rated 5 out of 5 by Anonymous from great look bought this for my dad’s 50th birthday and he loved it! Rated 4 out of 5 by Anonymous from Beautiful watch face and very classy professional and chic look Great watch if you want to look the part - be mindful of the large face however, as it depends on the size of your wrist as to whether the watch will suit or the face look slightly big. Lovely design overall.